Henley Rowing Club’s junior section led the Thames Upriver region to victory at British Rowing’s Junior Inter-Regional Regatta at the National Watersports Centre in Nottingham at the weekend. Competing against 11 other regions from across the UK, the Henley contingent claimed six victories as the Thames Upriver region took the Boys and Girls cups as well as the overall Victor Ludorum trophy. Racing over a 1500m course, Henley were representing the region in 8 events across 3 age groups. The Junior boys J16 quad of Charlie Rollet-Manus, Harry Farley, Alexander Meyer-O’Kane and Alasdair Roy were racing against old adversaries Tiffin School from the Thames London region. With a heat time of 5 minutes and 13 seconds, the boys were drawn in the first lane in the final. With a commanding start, the boys realised their potential shown in training and won with a margin of 10 seconds against the second placed East Midlands. The boys J14 double of Nick Spicer at bow and Jack Broadbent sculled a superb heat race in the morning with the 3rd fastest time overall. As the weather turned to sunshine for the afternoon finals, the boys were competing against a strong field, and just missed out on a bronze medal place. The Henley Junior Women’s Squad were out in force on Saturday and having won the majority of seats available for the region, expectations were high for the Henley girls. The WJ14 quad of Ruby Brown, Georgina Robinson Ranger, Lottie Orr, Issy Jonsson and Gemma Sarney as cox won their heat race in commanding style leading the field by over 17 seconds. 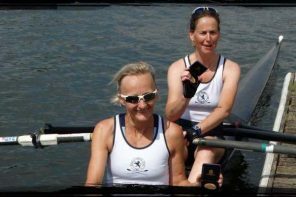 They repeated their success in the final by defeating Ross RC, representing West Midlands, by 15 seconds to win the second Henley gold medal of the day. The third win came from the WJ15 coxed quad of Ella Morgan, Clare Pearson, Katy Claridge, Florence Wiggins and cox Rebecca Lister. Their final time of 5 minutes and 41 seconds put them ahead of the entire field by over 12 seconds and pushed the Thames Upriver girls score further ahead of the other regions. 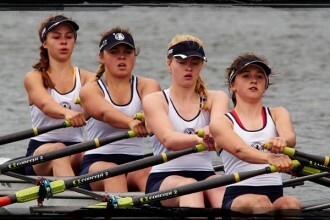 Henley contributed their fourth win to the Thames Upriver tally with a fine performance in the WJ15 coxed fours event. The boat of Lauren Kay, Georgia Edwards, Maisie Turner, Anna Roe and cox Emma Lister won their morning heat easily, and following a clean getaway at the start, the coxed four led from the front to win in a time of 6 minutes and 11 seconds, some 5 seconds ahead of the Eastern region in second place. 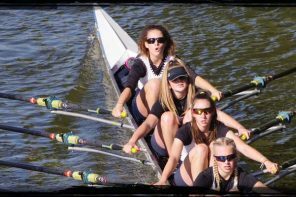 The WJ16 coxed four of Katie Beale, Iona McNab, Alicia Redman, Ella Wandless and cox Anna Roe were all rowing up a year from their usual WJ15 events and were competing against older girls including last years British Champions, Queen Elizabeth High School. Finishing second in their heat with a time of 6 minutes and 27 seconds , the girls were looking forward to the final battle. Starting strongly, the girls were rowing well in third place at the 500m mark when the umpire stopped the race and ordered a restart. The Henley girls started well again but unfortunately could not regain their third place and raced valiantly to fourth place. 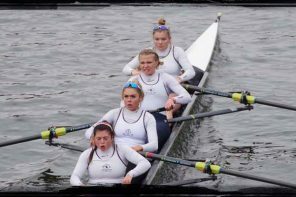 The WJ16 quad of Lauren Edwards, Maddie Orr, Ellie Thompson and Hattie Orr returned to Nottingham to retain their JIRR title and demonstrate their superior sculling on the national stage in advance of the National School’s Regatta at the end of May. Racing in their Kanghua quad kindly donated by Eric Sims of ES Rowing Services for the entire season, the crew won their heat with clear water in a time of 5 minutes and 38 seconds, a massive 30 seconds ahead of the second placed boat. The afternoon final was a repeat performance, the quad were a boat length ahead within 100m of the start, and the quad accelerated away to win in a time of 5 minutes and 32 seconds, making them the fastest junior women’s boat of the day. The sixth Henley win came in the penultimate event of the day in the WJ16 eights. The boat was comprised mainly of Henley’s WJ15 eight that won at the School’s Head in March and so were rowing up a year to a higher standard. Having won the morning heat easily, the Henley eight started well, edging a canvas within the first 100m. By the 500m mark, the Henley crew were a length ahead and left three other boats to compete amongst themselves for the silver and bronze medals. At half way, the Henley crew of Lauren Kay, Lily Stimpson, Florence Wiggins, Maisie Turner, Hannah Gutteridge, Georgia Edwards, Ella Morgan, Emma Lister at stroke and sister Rebecca in the cox’s seat accelerated further ahead, winning in a time of 5 minutes and 33 seconds, some 13 seconds ahead of the second placed Thames London.